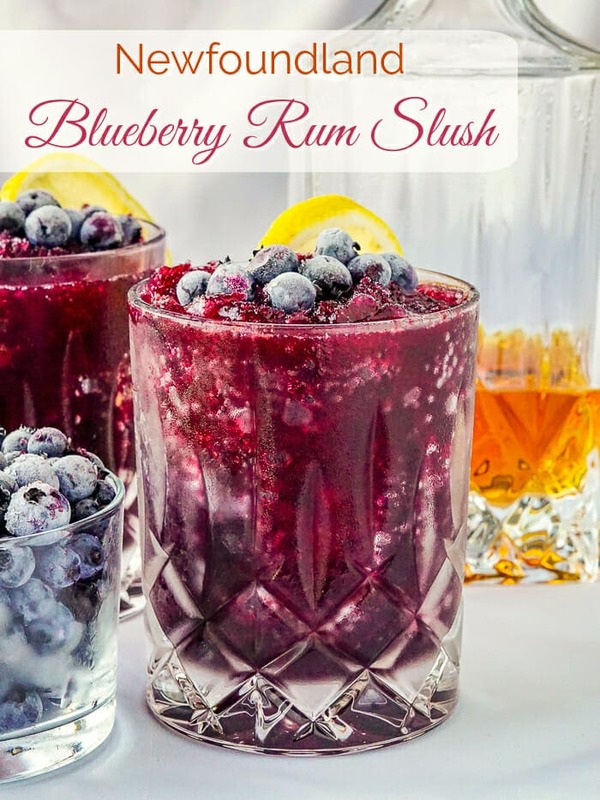 Newfoundland Blueberry Rum Slush - with no artificial colours or flavours! Newfoundland Blueberry Rum Slush. 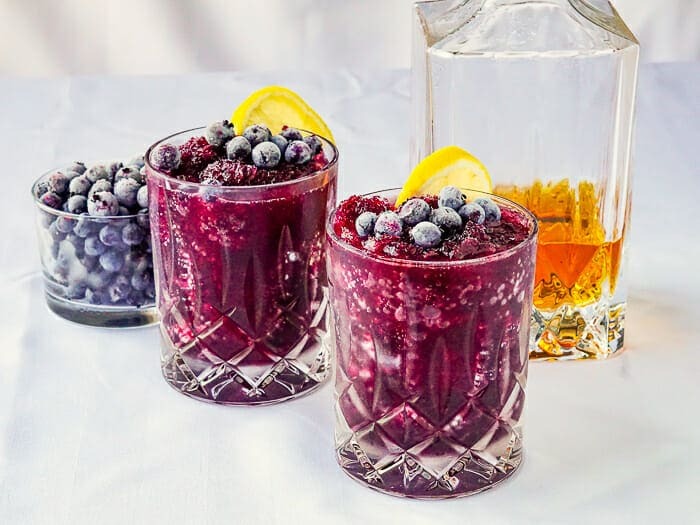 Just in time for the festive season, this make-ahead cocktail is made with wild Newfoundland blueberries and no artificial colours or flavours. With the festive season just around the corner I decided to share with you this make-ahead frozen cocktail. It’s perfect for pre-dinner drinks or even as the house specialty at your annual Christmas party. Last year, our Newfoundland Christmas Slush was such a hit that I knew I had to follow it up with something special this year. The Blueberry Rum Slush was the answer. This type of Christmas alcoholic slush has been made for decades here in Newfoundland. It is often found in freezers around the province in small recycled salt beef buckets as the storage vessel of choice. I considered several Newfoundland flavour inspirations for this new slush version but settled on wild blueberry. I wondered, with so may recipes for slush going around, why I had never seen one featuring our best known native berry. Perhaps this is not an original idea but I’ve yet to encounter a similar version. It really does seem like a natural choice for the Holidays in this part of the world. I’ve often said that I’ve tasted blueberries in other regions in North America but they are not the same as Newfoundland berries, which tend to be smaller and sweeter. The intense blueberry flavour lends itself well to this cocktail. I wanted to keep this recipe simple so I added very few other ingredients. Lemon is the only other main flavour really, which is adds a naturally complimentary note to blueberries while bringing some bright acidity to the tastebuds. If you don’t prefer rum, you can easily substitute vodka or gin. I plan to try gin next time because I think it’s juniper berry flavouring would be a naturally earthy compliment to the sweet blueberry flavour. You’ll often see low growing juniper bushes right beside blueberries anyway, so they are probably flavour matched by nature. A splash of club soda is all that’s needed to serve up this refreshing cocktail. The amount of the slushy ice base is easily adjusted to taste and alcoholic preference too. Give it a try, it may just be the hit of your Holiday season! 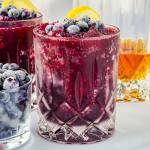 Like this Newfoundland Blueberry Rum Slush recipe? You’ll find many more traditional and Newfoundland inspired recipes in our Newfoundland section and even more Holiday recipe ideas in our Christmas Category. If you liked this recipe, you may also want to try our Orange Pineapple flavoured Christmas Slush. 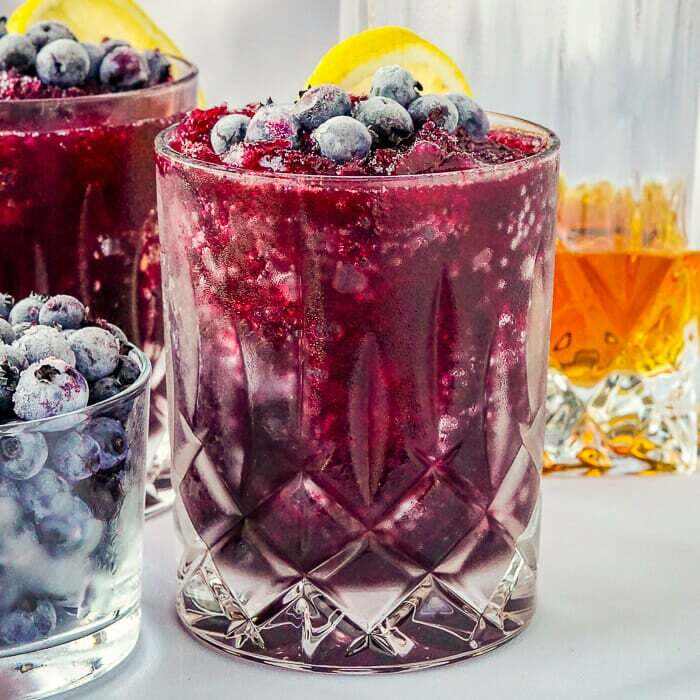 Newfoundland Blueberry Rum Slush - just in time for the festive season, this make-ahead cocktail is made with wild Newfoundland blueberries and no artificial colours or flavours. In any case, this recipe makes about 4 litres/quarts of slush so a 4.5 or 5 litre/quart container will be required. 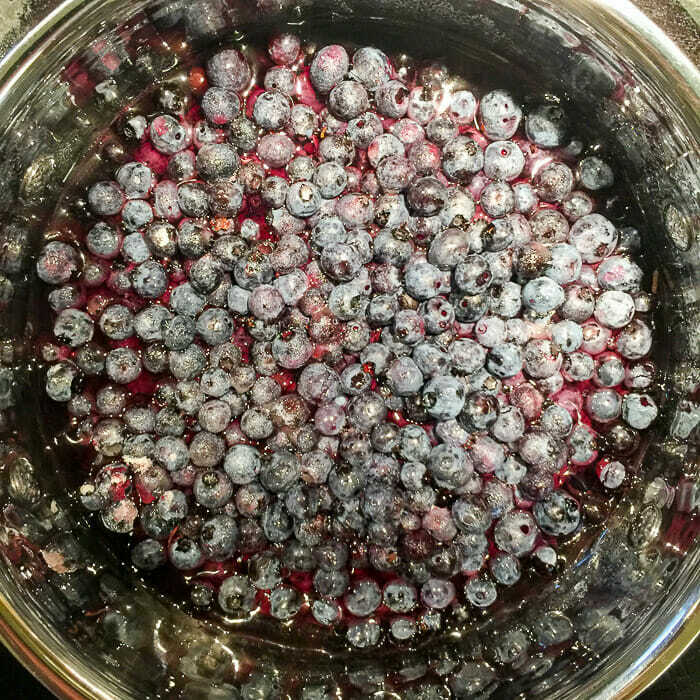 Add the blueberries to a saucepan and bring to a slow simmer for only about 5 minutes to get the berries to release their juice. You can add 1/4 cup of water to the berries if you like, in order to hasten the boiling process. At the same time, in a separate pot, add the 2 cups of sugar to the 2 cups of water and simmer for 4-5 minutes to make a simple syrup. Strain the juice off the berries and add it to a 4 quart (litre) covered plastic container (or larger). Puree the strained berries very well in a blender or food processor. Add the blueberry puree to the plastic container, along with the simple syrup and all of the remaining ingredients. Another suggestion is to serve the slush in martini glasses mixed with a splash of Prosecco and a garnish of a lemon slice and frozen berries on top. A 4 ounce serving of this slush with a 2 ounce splash of soda water per serving works out to a cocktail that is about 5% alcohol/volume. This recipe is also easily halved for a smaller batch of 2 litres, using a 375 ml flask of rum. When do you add the rum ? Did I miss that part? Instruction #7 reads: Add the blueberry puree to the plastic container, along with the simple syrup and all of the remaining ingredients. I made this a few weeks ago. It was amazing! Im thinking about making it again only maybe ill try using a bag of mixed berries since I am all out of my Newfoundland picked blueberries. Love your site! always great recipes! Can it be made non alcoholic? Or rum flavoring added? Great recipes!